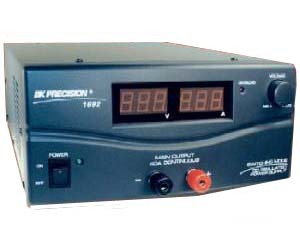 The B+K 1692 Switching Mode DC Power Supply provides high current output in a lightweight and compact package. It is suitable for a variety of uses, especially for powering DC operated mobile radio equipment on the bench. It provides a variable voltage output from 3V to 15V at 40A continuous operation. In addition a fixed 13.8 VDC output is also selectable by a slider switch. Switching mode power supplies have the advantage of lightweight and high efficiency when compared to traditional linear mode power supplies. The efficiency can exceed 80% under the best conditions. Advanced circuitry protects against overload and provides immunity from RFI. A bright red and green LED display provides for an accurate and highly readable indicator of settings.